The All-on-4® Treatment Concept is a relatively new technique in the United States but has been done for many years with great success in Europe. 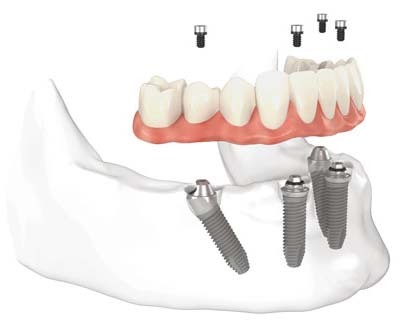 This technique uses fewer implants that are placed at mechanical inclinations to maximize support. Fewer implants mean lower cost. The use of angled implant placement allows us to avoid anatomical areas that previously required bone grafting. Eliminating the need for bone grafting saves months in healing and thousand of dollars. As compared to the All-on-4® treatment concept, there is no waiting for the surgical guide to be made. We could perform surgery on Monday and place teeth later the same day if you wish. All-on-4® treatment concept provides a comparable long-term outcome to Teeth-in-anHour™ by allowing a solid base to attach teeth that does not have to be removed. The All-on-4® treatment concept saves time and money, and we are excited to make this option available to our patients.